The miscreants, allegedly from the BJP, damaged a statue of erstwhile CPI-M stalwart Baidynath Majumdar at Kailasahar on Wednesday night. A desecrated statue in Tripura. GUWAHATI: The attack on statues of Left ideologues and erstwhile leaders of Left parties has continued in Tripura. The miscreants, allegedly from the BJP, damaged a statue of erstwhile CPI-M stalwart Baidynath Majumdar at Kailasahar on Wednesday night. Majumdar, who died a few years ago, had served as the state's Deputy Chief Minister from 1993-98 and as CPI-M's state secretary from 1998-2008. The CPI-M condemned the incident and staged a protest demanding action against the perpetrators of the crime. "One BJP group is involved in the incident. We demand the immediate arrest of the culprits. After the BJP came to power, their supporters either damaged, pulled down or defaced a number of statues of Vladimir Lenin and Che Guevara besides local leaders. Also, two roads (named after a Left ideologue and a teacher with Left lineage) have been renamed after Syama Prasad Mukherjee. Mazumdar was a public leader who was above politics. The destruction of his statue has hurt people, including BJP grassroots workers," CPI-M state secretary Bijan Dhar told TNIE. He alleged that the state was at the hands of a bunch of anti-social elements. "They have got a freehand as the Chief Minister and his ministerial colleagues are busy," Dhar said. The BJP denied its hand in the incident. "We have condemned the incident and taken out a protest rally condemning the act of the miscreants and demanding action against them," BJP spokesman Mrinal Kanti Deb said. It may be recalled that within days after the BJP had grabbed power in the state which shares a border Bangladesh, two statues of Communist icon Lenin were pulled down. 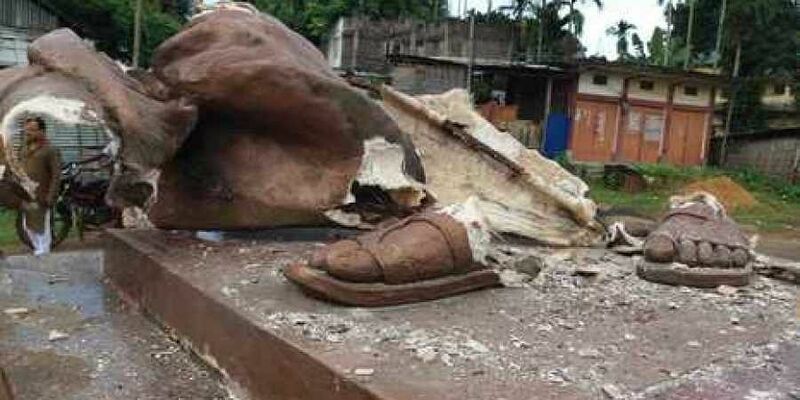 A five-foot high fibre glass statue of Lenin was toppled at Belonia while a smaller figure was razed at Sabroom. The Left had been in power in the state for 25 years until being ousted by the BJP in March this year.